One of Croatia’s true natural wonders is the stunning Krka National Park. 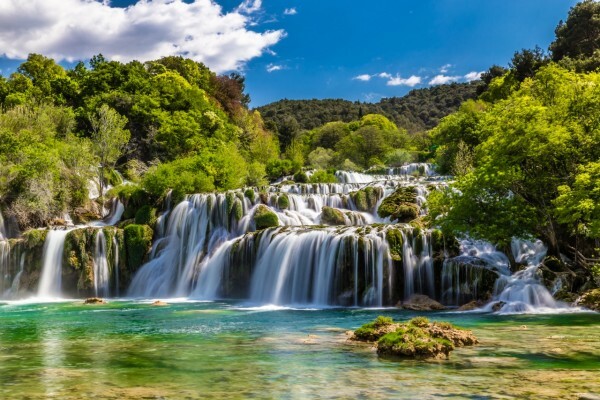 Join us on a spectacular day trip from Zadar where you can immerse yourself in the striking beauty of Krka National Park and its famous Skradinski Buk Waterfall. Take a swim in the crystal clear river waters, explore the nature trails, watermills and other cascading waterfalls in the park. The beauty of this day trip from Zadar is that you are in control of the day’s activities, being a private transfer, which means you determine when we start the tour and how much time you would like to spend in the park. In addition, we offer a stop in Sibenik where you can visit its famous fortresses and UNESCO listed St James Cathedral to make the most of your day. The day begins with us picking you up from your hotel or any other agreed location in our modern well-equipped minivan which has WIFI so you can stay connected. After a 45minute drive, we will arrive in Skradin where you will catch the boat and meander your way up the river to the Krka National Park entrance. You are now the master of your own destiny in the park and can spend your time as you please. Be sure to swim in the Skradinski Buk waterfall, walk the marked trails and explore the other falls and take in the charming watermills. You can grab a bite to eat in the park itself or wait until you head back to Skradin and have something to eat at one of the local taverns. After your Krka experience, it’s time to head to Sibenik where you will have time to discover the stone streets of this historic city which is famous for its UNESCO listed Cathedral of St James and its fortresses. Following your time in Sibenik, it’s time to make our way back to Zadar. Park Entrance fees (Tickets are 27 Euro / 200HRK, children under 7 are free). This is a private tour so we can structure the day any way you would like.